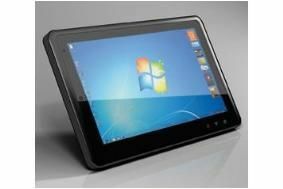 CES 2011: Windows-based itablet makes its debut | What Hi-Fi? One of the first out of the gates is the Windows-based itablet, developed by AHX Global, a joint venture between X2 Computing – one of the UK's leading suppliers of mobile computing solutions – and AMtek Systems, the Taiwanese manufacturer of tablet computers. itablet has a 10.1in capacitive touchscreen and a graphics processor that can deliver 1024 x 600 resolution images in landscape or portrait modes. There's a large on-screen keyboard, 32GB of storage, an integrated SD card reader and HDMI output. Audio playback is through the stereo headphones or the headphone socket. The device comes preloaded with Microsoft Windows7 Home Premium and a trial version of Microsoft Office 2010. It's powered by an Intel Atom Z530 1.6GHz processor, has two USB ports, Bluetooth and 802.11b/g/n wi-fi compatibility. It weighs less than 1Kg.